Are you into natural products? I personally love exploring natural product lines...especially when it comes to bath and body care products. Your skin is your body's largest organ. With so much surface area to absorb product, it makes sense treat your skin right, when you can, with natural products. No, I do not use 100% natural products across the board all the time. However, if I had two similar products side-by-side that worked similarly and one was natural and one was not, there is no question I would choose to use the natural product over one with chemicals and preservatives. I am all about adding natural when you can. Even just a little bit helps to decrease your overall chemical exposure. I am super excited about a natural products line that I have been exploring lately: Nubian Heritage. I am in the process of trying out both bath and body items from this line as well as facial skincare products (that review coming soon, too!). So, lets start off by talking a little bit about this interesting brand and then I will dive into my review! Nubian Heritage got its start 25 years ago on the streets of Harlem. Just out of college, former roommates, Richelieu Dennis and Nyema Tubman set out to produce luxurious natural products from traditional African recipes with fair trade and organic ingredients and bring them to the community. They were inspired by the legacy of ancient Nubia, which was once a center of cultural trade – a place where goods, ideas, and customs from across Africa, Asia, the Mediterranean and the Middle East were exchanged and spread across the world. The street vendors brought together global healing practices, cultural wisdom and indigenous ingredients to create modern wellness solutions that were highly sought after. Today, the brand offers hundreds of culturally authentic natural products that are free of sulfates, parabens, phthalates, paraffin, gluten, propylene glycol, DEA, silicones, mineral oil, petroleum, synthetic fragrance and artificial color, and never tested on animals. So, now that you know a little bit more about Nubian Heritage, lets talk about the awesome product that I tried out! 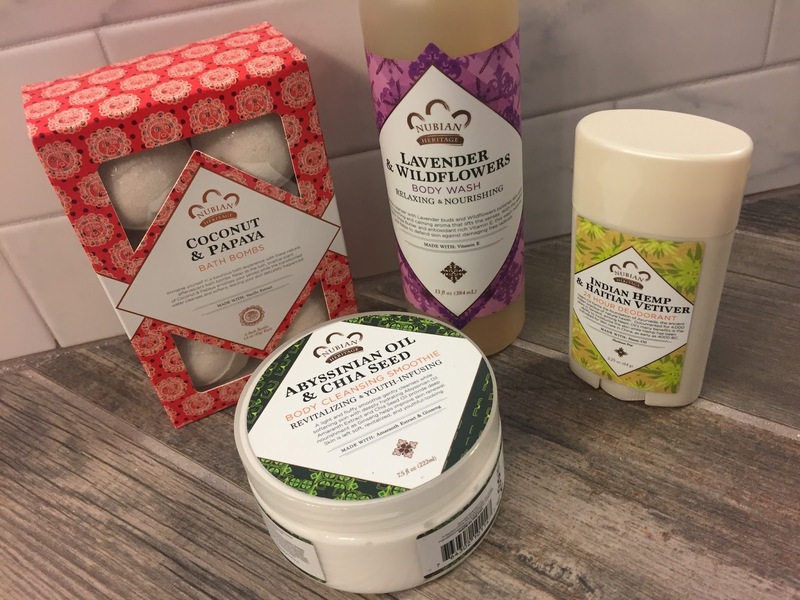 To hear about a variety of bath and body products from Nubian Heritage, please click "read more" below! I just adore little bath "treats". Fun bath items, like bath bombs, are what seems to inspire me to take a bath. Often I am "too tired" in the evening to get a bath going...when honestly a bath is just what I need. I find that when I have super fun and inspiring bath products, I am more motivated to take a relaxing evening bath (and I am always glad when I do end up in the tub!!!). 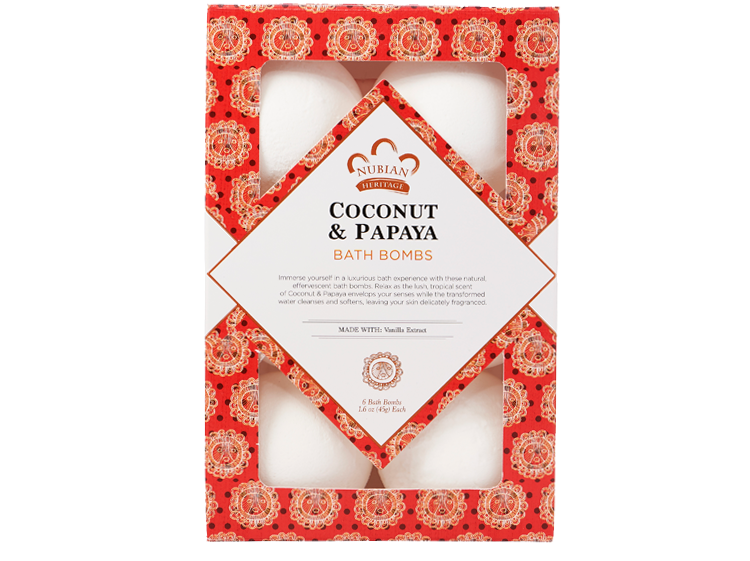 These Coconut & Papaya Bath Bombs by Nubian Heritage smell soooooo good! This scent is perfectly tropical for the hot Spring and Summer months. 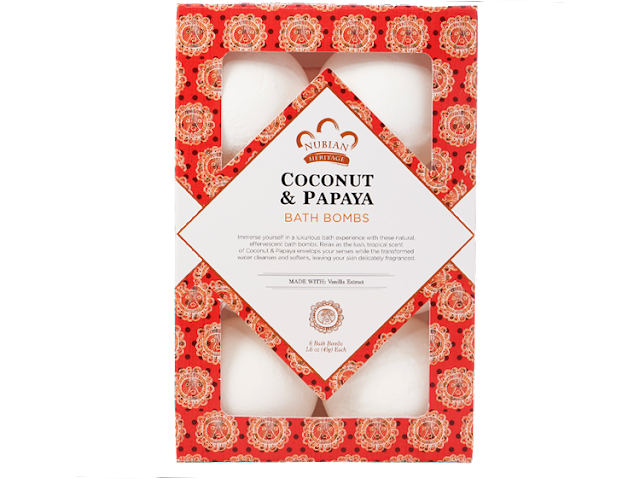 These Effervescent bath bombs are infused with Coconut Oil and Papaya Extract to invigorate and hydrate your skin while you soothe and relax in your bathtub! Just fill up your tub and drop one of these bath bombs in for a super fun bath experience. This is such a lovely body wash! I know the scent is Wildflowers & Lavender but somehow this body wash smells somewhat fruity to me (definately not your typical lavender scent). I find that this body wash is super soothing to my skin and it leaves me smelling lovely! Now this is what I call a luxury bath product! 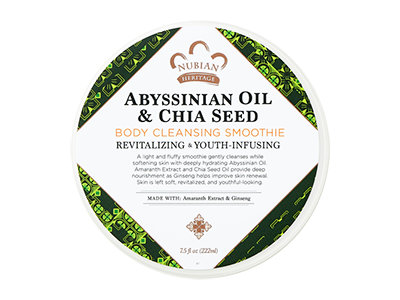 It is a light and fluffy smoothie that gently cleanses while softening the skin with deeply hydrating Abyssinian Oil, Chia Seeds, Amaranth Extract and Ginseng. This product is a total treat to use and honestly turns my shower into a bit of a spa experience. ;) It is essentially a luxuriously smoothing and softening cream cleanser for your body. It leaves you clean and super hydrated and soft. I have been on a bit of a Natural deoderant kick lately. No, I can't use natural deoderants every day as I do tend to sweat a lot and get stinky. However, on "easy" days when I am essentially just at home relaxing, I love to use Natural deoderants. This one is a great options from Nubian Heritage. 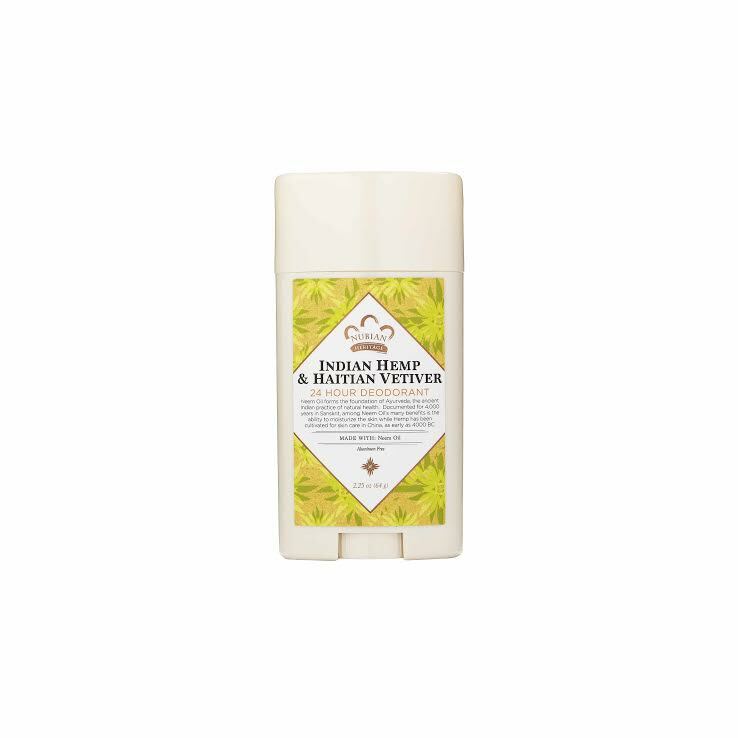 I really like the Indian Hemp and Vetiver scent and find it to be effective and refreshing. Do I get 24 hours of protection, well...not really, but I never do from a natural deoderant. With that said, I do find it to be effective. Propanediol is the "active" ingredient in the deoderant. It is a tested and effective natural ingredient derived from Corn in a fermentation process while Vegetable Glycerin and Organic Shea Butter soothe and nourish skin. Plus, the deoderant is infused with Nubian's Signature Indian Hemp and Haitian Vetiver Fragrance. Be sure to check out Nubian Heritage!!! The products are fantastic and natural. They are available at NubianHeritage.com, Vitamin Shoppe and Whole Foods, among other retailers.